In these catacombs, there are different crypts of the most important people in the church. 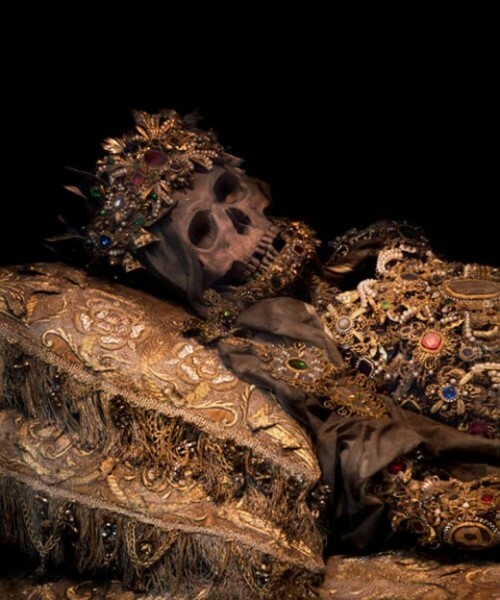 The most significant was the Crypt of the Popes. It is called "The Little Vatican" as it was the official burial place of nine popes and, probably, of eight dignitaries of Rome's 3rd century Church. In the walls you can still see the original inscriptions, in Greek, of five popes. On four tombstones, near the name of the pope, there is the title of "bishop", since the Pope was regarded as the head of the Church of Rome, and on two of them there is the Greek abbreviation of MPT for "Martyr". The names of the five popes were Pontianus, Antherus, Fabian, Lucius and Eutichian. In the front wall was laid to rest Pope Sixtus II, a victim of Emperor Valerian's persecution. (“Following the…”). The art of the catacombs is another significant feature. From the end of the second century, an extremely simple art developed in the catacombs which is in part narrative and in part symbolic. The paintings, mosaics, reliefs on the coffins and minor arts recall stories from the Old and New Testaments, as if to present the examples of salvation from the past to the new converts. This is why Jonah is often portrayed; being that he was saved from the belly of the whale where he remained for three days, which re-evokes Christ’s Resurrection. There are also representations of the young people of Babylonia rescued from the flames of the furnace; as shown above, Susan saved from the snares of the elders, Noah who escaped the flood, and Daniel who stayed unharmed in the lions’ den. (“The Christian…”). The art of the catacombs is also a symbolic art in the sense that some concepts which are difficult to express are represented in a simple way. To indicate Christ, a fish is depicted; to signify the peace of heaven, a dove is represented; to express firmness of faith, an anchor is drawn. On the closing slabs of the loculi, symbols with different meanings are often engraved. In some cases, a tool is depicted which indicates the dead person’s trade in life. Some symbols, such as glasses, loaves of bread and amphorae, allude to the funeral meals consumed in honor of the deceased, the so-called refrigeria. Most of the symbols refer to eternal salvation, such as the dove, the palm, the peacock, the phoenix and the lamb. (“The Christian…”). According to the Fox news, the earliest known icons of the Apostles Peter and Paul have been discovered in a catacomb under an eight-story modern office building in a working-class neighborhood of Rome. The images, which date from the second half of the 4th century, were discovered on the ceiling of a tomb that also includes the earliest known images of the apostles John and Andrew. They were uncovered using a new laser technique that allowed restorers to burn off centuries of thick white calcium carbonate deposits without damaging the dark colors of the original paintings underneath. (“Archaeologists…”). It is said that Christians built these catacombs in order to “hide out” during Christian persecution. In my view, they wanted a safe and proper way to bury the dead of their loved ones. They also put a lot of work and effort into these catacombs. Not only were they places to bury their dead, but they were places to paint their magnificent art on the superior tombs of their beloved ones telling their story to others. "Archaeologists Find Oldest Paintings of Apostles in Roman Catacombs." Fox News. FOX News Network, 22 June 2010. Web. 18 Oct. 2012. "Early Christian Catacombs, Rome." Early Christian Catacombs. Sacred Destinations, 6 Dec. 2009. Web. 18 Oct. 2012. "FOLLOWINGS THE ITINERARIES." The Catacombs of St. Callixtus. Salesian Istitute S.t Callixtus, Rome. The Christian Catacombs of Rome. Istituto Salesiano San Callisto - Rome, n.d. Web. 18 Oct. 2012. "The Christian Catacombs." The Christian Catacombs. N.p., n.d. Web. 18 Oct. 2012. 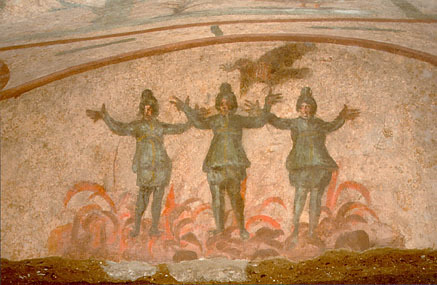 "Rome, Catacombs of Priscilla – Three Children in the Furnace." Vatican: The Holy See. N.p., n.d. Web. 18 Oct. 2012. 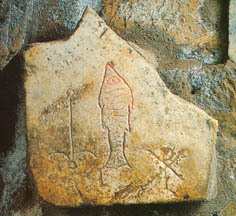 "Rome, Catacombs of St. Sebastian – Funeral Inscription with Symbols." Vatican: The Holy See. N.p., n.d. Web. 18 Oct. 2012. "St Deodatus." Tumblr.com. N.p., Aug. 2012. Web. 16 Oct. 2012. This website has information about the Christian symbols and their origin. It also has links to different picture collections and historical studies on each. This website provides information on the catacombs such as the origin, art, and characteristics.